Although singer Dianne Reeves’ set was cut short by a thunderstorm and alto saxophonist Maceo Parker proclaimed early in his climactic set that he doesn’t play jazz—and commenced to prove it—the 40th annual Chicago Jazz Festival fulfilled ambitious goals. Five days of performances at Millennium Park with successful homegrown headliners Ramsey Lewis, Kurt Elling and trumpeter Orbert Davis, plus two afternoons of programs at the nearby Chicago Cultural Center, drew thousands of residents and visitors to appreciate the widely varied music of a vibrant, multi-dimensional local scene. Thanks to the city’s Department of Cultural Affairs and Special Events Commissioner Mark Kelly, once a drummer for maverick bandleader Hal Russell, funding also went to eight off-site venues across town, allowing them to offer shows without a cover charge in the week prior to the fest’s Aug. 29 kickoff. 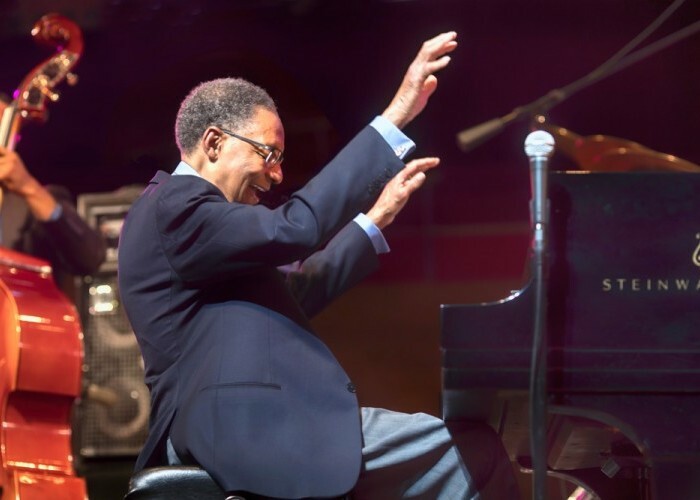 That evening, a two-and-a-half hour cavalcade of native legends and lions, backed by Davis’ 60-piece Chicago Jazz Philharmonic, presented exciting, genre-spanning artistry with tradition and experimentation in almost equal measure. The fest’s setting was ideal. Sound projection at the Frank Gehry-designed Jay Pritzker Pavilion served the 11,000-capacity seating and grassy field that had folks of all ages lounging between Chicago’s breezy lakefront and dramatic skyline. Four side-stages running from about 11 am to 4 pm from Aug. 30 to Sept. 2 forced fans to make hard choices or hot-foot through a promenade crowded with vendors’ tents and the iconic Cloud Gate sculpture to catch bits of simultaneously scheduled sets. Lewis, arguably Chicago’s best-known living jazz player, had promoted his Urban Knights’ appearance as his last before retirement; he’s since backed off that notion. Accompanied notably by guitarist Henry Johnson, keyboardist Tim Gant and drummer Charles Heath, he played his hits, including “In Crowd,” songs from Sun Goddess (his album with Earth Wind & Fire’s Maurice White), The Beatles’ “A Hard Day’s Night,” The Stylistic’s “Betcha By Golly Wow” and “After Hours.” Considering the fest also featured pianists Kenny Barron in a quintet, Barry Harris and Charles McPherson in a quartet, Arturo O’Farrill’s Sextet (featuring his sons, trumpeter Adam and drummer Zack), Matthew Shipp (with tenorist Ivo Perelman) and both Myra Melford and Amina Claudine Myers in an ensemble remembering Muhal Richard Abrams, Lewis’ jazz was modest and mild, yet well-received. Unique vocal stylist Elling, in a surprise duet with Tammy McCann on opening night, launched his own powerful quintet performance with Bob Dylan’s “A Hard Rain’s A-Gonna Fall,” turning it and most of his set into a personal statement with political implications. Though Elling currently lives in New York City, he called Chicago “home” and enjoyed loyal support from John McLean (guitar), Stu Mindeman (piano and B-3), Clark Sommers (bass), Marquis Hill (trumpet) and Jeff “Tain Watts (drums). Maceo Parker seemed to have been brought in as a crossover attraction. But he jokingly insulted jazz, spoofed Duke Ellington by racing through “Satin Doll” and wasted time with weak imitations of his past employers, Ray Charles and James Brown. Although he’s a capable hornman, his loud ensemble lacked spontaneity and deep-down funk. His most genuine moments were during his flute obbligato for his backup-singing niece. The fest’s other music was truer. Representative members of the born-in-Chicago AACM, such as Ernest Khabeer Dawkins (leading the Great Black Music Ensemble), drummer Avreeayl Ra, clarinetist Mwata Bowden (in the Muhal tribute) and cellist Tomeka Reid, who subbed for flutist Nicole Mitchell when she was called away by a family emergency, demonstrated improvisational individuality in the context of challenging collaborations. Worthy, if less celebrated, instrumentalists made strong impressions, several presenting recently recorded works in full, including saxophonists Geof Bradfield and Dustin Laurenzi, bassist Matt Ulery, trumpeter Jaimie Branch and bass clarinetist Jason Stein.